Posted March 1, 2018 by SJ Eye & filed under SJ Eye News, South Jersey Eye Associates. [Bridgeton, March 2018] — With the popularity of video games and competitive gaming on the rise, players are always looking for an edge. 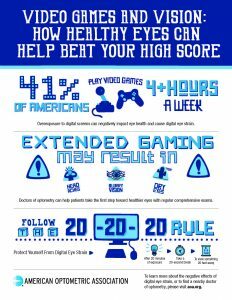 Whether battling a computer opponent or Player Two, one secret weapon can help land the high score: the American Optometric Association’s (AOA) 20-20-20 rule, which encourages gamers to give their eyes a 20-second rest every 20 minutes. The AOA’s 2017 American Eye-Q® survey revealed that 41 percent of Americans spend more than four hours a week playing video games. Staring at digital devices can lead to digital eye strain, sleep problems, blurred vision, headaches and neck and shoulder pain, among other things. Yet, only 21 percent of Eye-Q® respondents have talked to an eye health professional about the amount of time spent playing video games. In addition to encouraging players to discuss game usage with an optometrist, South Jersey Eye Associates is sharing some insider tips on how to help ease eye discomfort during this year’s Save Your Vision Month in March. Level up with the AOA 20-20-20 rule: When you are using any electronic gaming device or computer, make a conscious effort every day to take a 20-second break and look away from the screen, every 20 minutes and view something 20 feet away. Position yourself: Maintain a comfortable working distance from your gaming device by using the zoom feature to see small print and details, rather than bringing the device closer to your eyes. Beat the glare: The AOA recommends reducing the glare by adjusting device settings or using a glare filter to decrease the amount of blue light reflected from the screen. Consider buying protective eyewear: Experiment with blue light filter glasses to limit the blue light beaming from your screen. Schedule an appointment: Contact South Jersey Eye Associates to schedule an appointment for a comprehensive eye exam to detect and address vision problems. “Those who spend excessive time in front of screens may experience physical discomfort, like the nearly one-third of gamers who reported headaches or blurry vision in our survey,” said Dr. Wuzzardo. “Save Your Vision Month is the perfect time to prioritize eye health by practicing the 20-20-20 rule,” said Dr. Feinstein. If you think you are experiencing any of the symptoms listed on the side due to prolonged exposure to digital devices, schedule an appointment with South Jersey Eye Associates. For additional information on how eye health may be impacted while playing video games, please visit www.aoa.org. The American Optometric Association commissioned a 20-minute, online survey among a nationally-representative sample of n=1,002 U.S. adults ages 18+. The margin of error for this sample is +/-3.1% at the 95% confidence level. The survey was fielded between November 3 and November 9, 2017. The American Optometric Association, a federation of state, student and armed forces optometric associations, was founded in 1898. Today, the AOA is proud to represent the profession of optometry, America’s family eye doctors, who take a leading role in an individual’s overall eye and vision care, health and well-being. Doctors of optometry (ODs) are the independent primary health care professionals for the eye and have extensive, ongoing training to examine, diagnose, treat and manage disorders, diseases and injuries that affect the eye and visual system, providing two-thirds of primary eye care in the U.S. For information on a variety of eye health and vision topics, and to find an optometrist near you, visit www.aoa.org. Posted February 28, 2018 by SJ Eye & filed under SJ Eye News. Posted February 14, 2018 by SJ Eye & filed under Low vision specialists, SJ Eye News, South Jersey Eye Associates. New studies predict a boom in cases of low vision, but help is available. As the last of the baby-boom generation approaches the age of 65, the number of cases of visual impairment and blindness is projected to experience a boom of its own in the coming years. According to recent studies funded by the National Eye Institute (NEI) of the National Institutes of Health (NIH), the number of Americans who are visually impaired—including those with low vision— is expected to double to more than 8 million by 2050. Posted February 1, 2018 by SJ Eye & filed under Bridgeton Eye Doctors, Cumberland County eye doctors, Low vision specialists, Salem County eye surgeons, SJ Eye News, South Jersey Eye Associates, Vision therapy specialists. Age-related macular degeneration (AMD) is the leading cause of vision loss for individuals age 50 and older. 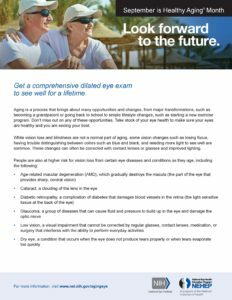 In its earliest stages, AMD can be difficult to diagnose. In some cases, AMD progresses so slowly that many do not notice a change in their vision. In other cases, the deterioration is very rapid and can appear to happen overnight. Low Vision is a term used to describe significant vision impairment that cannot be corrected with glasses, surgery, or medication. Most people develop low vision because of eye diseases and health conditions like macular degeneration, cataracts, glaucoma, and diabetes. While the condition isn’t reversible, medical care, support, and rehabilitation can help patients make the most of their remaining vision and enable them to attain a higher quality of life. South Jersey Eye Associates offers both Low Vision Assessments and Rehabilitative Services designed to help our patients recover independence lost due to vision impairment. We are dedicated to providing patients with the expertise, information, and support they need to meet the challenges that Low Vision presents in their day-to-day lives. Posted January 29, 2018 by SJ Eye & filed under SJ Eye News, Vision Library. Posted January 29, 2018 by SJ Eye & filed under Vision Library. Posted January 1, 2018 by SJ Eye & filed under Bridgeton Eye Doctors, Cumberland County eye doctors, Glaucoma Specialist, SJ Eye News, South Jersey Eye Associates. As you plan for a healthier new year, why not add this sight-saving exercise to your list of resolutions: Get a comprehensive dilated eye exam. It’s the only way to find out for sure whether you have glaucoma, one of the leading causes of blindness in America. An eye disease that can rob you of your vision, glaucoma often comes with no early warning. No pain. No discomfort. No blurry vision. Nearly 3 million people have glaucoma, yet half don’t know they have it. Glaucoma starts with a buildup of fluid that increases the pressure in your eye and can cause damage to the optic nerve, the bundle of nerve fibers that transfers visual images to your brain. Glaucoma first affects your peripheral, or side, vision. As the disease advances, more noticeable vision loss will occur, and if not controlled, the disease can lead to permanent vision loss and blindness. Everyone, especially those at higher risk, should make it a point to get a comprehensive dilated eye exam every year as recommended by your doctor here at South Jersey Eye Associates. 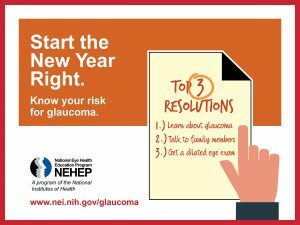 Early detection and treatment are the best ways to control glaucoma. 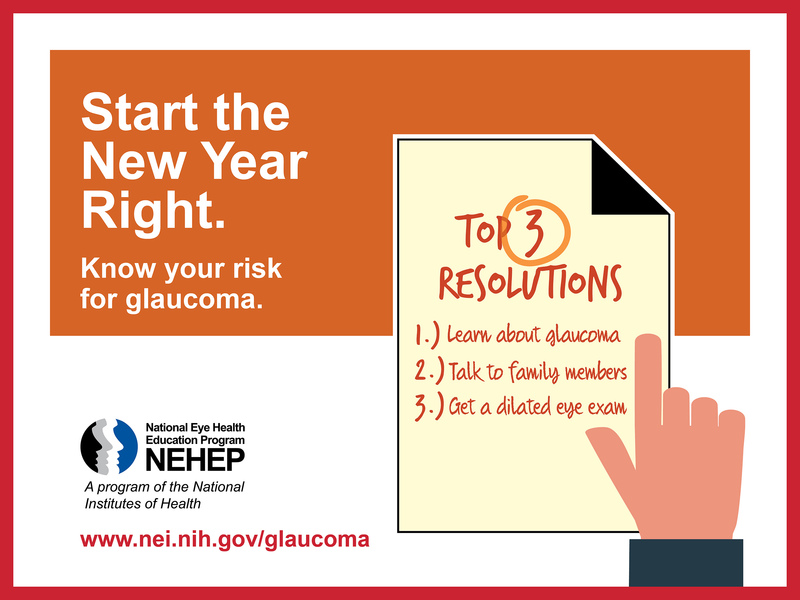 This year, make a resolution for healthier vision. Make sure your eyes are healthy and you are seeing your best in the new year. Schedule a comprehensive dilated eye exam and encourage your friends and loved ones to do the same. This message is provided with the support National Eye Health Education Program. Posted September 5, 2017 by SJ Eye & filed under SJ Eye News. Aging is a process that brings about many opportunities and changes, from major transformations, such as becoming a grandparent or going back to school to simple lifestyle changes, such as starting a new exercise program. Don’t miss out on any of these opportunities. Take stock of your eye health to make sure your eyes are healthy and you are seeing your best. While vision loss and blindness are not a normal part of aging, some vision changes such as losing focus, having trouble distinguishing between colors such as blue and black, and needing more light to see well are common. These changes can often be corrected with contact lenses or glasses and improved lighting.